Most people understand that when they’ve been injured by another person’s negligence, they can seek compensation through a court of law. However, few are well-versed in the legal terms and definitions associated with such a claim. Below is a basic overview of these commonly used terms that you’ll need to familiarize yourself with throughout your claim. 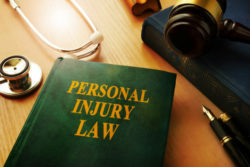 Personal injury law encompasses the legal remedies available to individuals who believe they have suffered losses as a result of wrongful and negligent conduct. Most often, the victim is seeking out financial compensation for the losses they have endured. Negligence, as defined below, must be proven to have caused the injury. Proximate cause: This term defines the main cause or reason an accident occurred. Without the proximate cause, the accident would not have occurred. Did you or a loved one sustain serious injuries due to personal injury in New Jersey? Don’t let the medical bills pile up while you wait for the negligent party, or their insurance company, to do the right thing. Right now, you need an aggressive personal injury attorney on your side, fighting to get you the compensation you need, want, and deserve. The skilled attorneys at The Law Offices of Richard A. Stoloff represent clients injured because of personal injuries in Linwood, Atlantic City, Egg Harbor Township, Hammonton and throughout New Jersey. Call (609) 601-2233 or fill out our online contact form to schedule a free consultation about your case. We have an office conveniently located at 605 New Road, 1st Floor, Linwood, NJ 08221, as well as our offices in Philadelphia, PA.